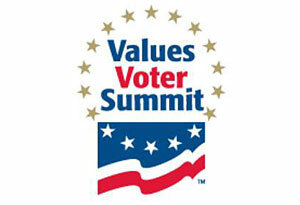 It’s that time of year again, when hate groups from around the nation gather together for one big jamboree, the Value Voters Summit (VVS). Running from Friday through Sunday–with a pre-summit training session for activists–VVS is the chance for the anti-LGBTQ right to assert its influence as leading politicians, starting with Vice President Mike Pence, pay it court. VVS is a veritable who’s who of the right, starting with its sponsor: FRC Action. That group is the legislative arm of the Family Research Council, which has been declared a hate group by the Southern Poverty Law Center. This year’s summit has multiple sessions on LGBTQ issues–or more accurately, how to fight them. A session on how to get conservative Christians elected is being led by staffers from the American Family Association, which has been attacking LGBTQ people and their supporters for years. Religious freedom is a hot topic at this year’s VVS, particularly as the religious right awaits Brett Kavanaugh’s (now complicated) elevation to the Supreme Court. “This topic comes in an age of transgenderism, LGBT discrimination laws, and national outcry over who gets to use which restroom — a time when gender is given to self-determination and may change daily,” according to the program description. Lined up a for VVS are the usual array of suspects, including the Benham brothers, Fox pundit Laura Ingraham (whose gay brother called her “a monster”), and Jack Phillips, the owner of the Masterpiece Cakeshop who refused to bake a wedding cake for a gay couple. If VVS’s attendee list was confined to fringe operators, the event would be just an echo chamber. The problem is that the summit is now a go-to meeting for Republican politicians in Congress and the White House. It’s not just Pence. Among the other confirmed speakers at the VVS this year are Secretary of State Mike Pompeo, Senate Majority Leader Mitch McConnell, Sen. Lindsey Graham and Florida Governor Rick Scott. The guest list is a sign of how critical the religious right has become to the current Republican party. The summit got a huge boost as a power venue last year when Donald Trump became the first president to make an address there. No doubt, VVS will produce the predictable rhetoric bashing LGBTQ people (and Muslims and liberals and Democrats and…). If it was only just rhetoric, the event would be awful. But because of the access they have, the people at the summit are shaping the policies. That makes the Summit dangerous.